Mike was born in 1954 in Stevenage, a New Town 30 miles north of London. For thirty years he worked in the higher education sector as a librarian (Bristol and Southampton universities) but now concentrates on photographic and writing projects. In recent years he has exhibited his photographs and book works internationally in several solo and group shows. England and Nowhere book. I'm reading the review section of the Guardian newspaper one Saturday and, above a review of Yuki Chan in Brontë Country, a novel by Mick Jackson, there's a lovely photograph of, presumably, the North York Moors. Even on newsprint, it's striking: a long vista over a craggy moor, alive with the russet and green tones of moorland in scudding sunlight. You can practically feel the wind tugging at your clothing. In the mid-distance, there's a crag that could be a house or a house that could be a crag. So I look to see who made it; to do this, I have to turn the paper sideways and squint at the truly tiny picture credit at the bottom right-hand edge. It reads ALAMY. Nothing else. This beautiful image has been sourced, merely for illustrative purposes, from a stock photo agency. 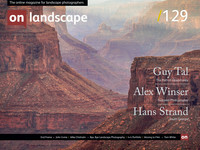 Later, looking through Landmark, an intelligent and interesting anthology of contemporary landscape work compiled by William A. Ewing, I find myself wondering, is landscape photography over? In one sense, clearly not: more and more people are producing more and more landscape photographs, and it has become both a major genre in its own right and an important ancillary to other activities, like walking, climbing, travelling and even spirituality and philosophy. But... sheer populousness is often a sign that something has peaked, and that its exciting, pioneering days are over. Given how varied the world is, and how different people are, I wondered: why do so many landscape photographs look exactly the same? Why are they so unregarded? To the extent they can be bought by the yard, and published uncredited?